The minimalist aesthetic is an ode to unfussy, clean lines and styles that emphasise natural silhouettes. Incorporating elements of minimalism into your style can help you look effortlessly chic, like you threw on something without much thought. However, nothing could be further from the truth. While the final look might look simple, there’s a lot of thought that goes behind putting it together. A minimalist style needs to look elegant, not boring. Accessories can help you achieve that. Elements of minimalism in jewellery are one of the top emerging jewellery trends you should know about. The perfect minimalist accessory uses simple, fluid lines and very little embellishments to create a stunning style statement. If you’re a minimalist fashionista, here are five new pieces of jewellery to add to your collection. A simple yet beautiful pair of stud earrings is a jewellery-essential if you love minimalist styles. Stud earrings give your outfit a subtle hint of sparkle, without upsetting the natural balance of your look. Instead of floral and paisley patterns, choose stud earrings which have uncomplicated shapes. For an extra element of style, pick a pair of diamond stud earrings that can add an extra element of style to your outfit. A single stone fits in with your sophisticated look, but too many can make the final outfit look gaudy. 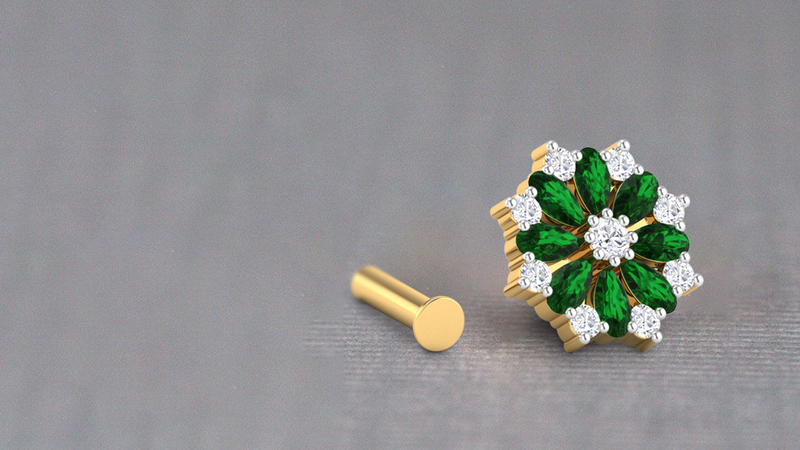 If you’re looking for a pair of beautiful stud earrings, take a look at our Emerald Solitaire Stud Earrings. These unique stud earrings have a single emerald embedded in 18K gold for a minimalist look that is anything but dull. When you’re wearing stud earrings, tie your hair up, or tuck one side behind your ear so your studs shine bright. A solid metal bangle is the perfect complement to your minimalist look. Bangles or cuff bracelets are a great way to accessorise your outfit because they make a statement without being too loud. Always choose a single bangle, because this strikes the perfect balance between eye-catching and understated. You can even choose a bracelet that has a few stones embellishing it, but make sure it still looks simple. Too many stones and elaborate patterns can clash with your minimalist aesthetic. Our Dew Droplet Diamond Bangle is the only accessory you need when you’re putting together a minimalist look. The tiny diamonds which are set in solid gold are the perfect way to accentuate your wrist. A great way to draw attention to your bangle is to pair it with a black full-sleeved outfit and then wear the bangle over the sleeve. Geometric patterns and minimalism is a match made in heaven. The sharp angles and clean lines of geometric jewellery go perfectly with a minimalist aesthetic. You can incorporate geometric elements into virtually any accessory you choose to add to your outfit. A hexagon-shaped bangle, a sharp, pointed ring or an angular pendant can add a unique, unusual facet to your minimalist look. Another interesting way to accessorize with geometrics is with your earrings. Discover our Classy Hexagons Diamond Earrings for a pair that will truly stand out in your collection. These earrings are the only accessory you need to make your look stand out. Has it been drilled into you that you should never mix metals? Well, it’s time you gave in to your rebellious side and broke the rules. When done right, mixed metals can look unexpectedly stylish. Mixing metals gives you plenty of room to express yourself, but stick to wearing just two different metals at a time. Copper and silver or gold and platinum blend together seamlessly. A great way to mix metals is to experiment with stackable rings. Delicate stacked rings are the perfect minimalist style statement because they are quirky, yet elegant. When you’re stacking rings made up of different metals, make sure you don’t include rings with stones as well, because this could end up looking chaotic. A delicate nosepin accentuates your features in a very subtle way and deserves a place in every minimalist’s jewellery collection. Many women are hesitant to wear a nosepin because they’re not sure if it will suit them. However, if you know how to pick the right nosepin for your face shape, then there’s no better way to elevate your look. Nose pins are stylish, fashionable and a beautiful nosepin that catches the light every time you turn is the best way to add a little intrigue to your minimalist look. If you’re excited to add a nosepin to your jewellery collection, take a look at our Avalon Diamond Nosepin. This tiny nosepin has a unique geometric design, which adds an edge to your minimalist style. With these accessories, you will be all set to rediscover the timeless elegance of a minimalist style aesthetic. To help you build your simple, elegant jewellery collection, visit Zaamor. Our curated collection of exquisite earrings, nosepins, bracelets and more is every jewellery lover’s dream come true.